Over a century ago, the R.M.S. Titanic, the largest passenger liner in service at the time, sank in the north Atlantic Ocean on the night of 14 April through to the morning of 15 April 1912. The ship which had an estimated 2,224 passengers on board when she struck an iceberg at around 23:40 (ship’s time) on Sunday, 14 April 1912, was four days into her maiden voyage from Southampton to New York City. The aftermath of her sinking at 02:20 (05:18 GMT), two hours and forty minutes after striking the iceberg, resulted in more than 1,500 deaths. The incident was recorded in the history books as one of the deadliest peacetime maritime disasters in history. One of the victims of the disaster was Wallace Henry Hartley, the bandmaster on the Titanic. He was born on 2 June 1878 and was the son of Albion and Elizabeth Hartley of Colne, Lancashire. At the time of his death, at the age of 33, his home was Surrey side, West-Park street, Dewsbury, England. 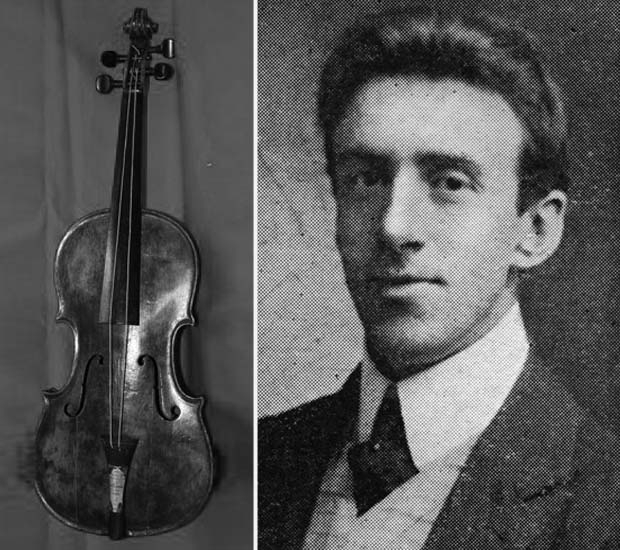 Hartley was giving solo violin performances by the age of 15 before going on to lead an orchestra in Bridlington. Soon after, he accepted a position with Cunard entertaining passengers on cruises across the Atlantic on such liners as the Mauretania and Lusitania. He was also a member of the Savage Club in Leeds. By the time he boarded the Titanic in 1912 as bandmaster, he had already made approximately 80 voyages. He had spent time with his fiancé who lived in Boston Spa, near Wetherby in Yorkshire, before boarding the Titanic. After the ship collided with the iceberg he led the orchestra in playing ragtime tunes. A newspaper at the time reported, “the part played by the orchestra on board the Titanic in her last dreadful moments will rank among the noblest in the annals of heroism at sea.” Legend states that the last song that the orchestra played was “Nearer, My God, to Thee,” a 19th-century Christian hymn by Sarah Flower Adams, based loosely on Genesis 28:11–19, the story of Jacob’s dream. The hymn was one of Hartley’s personal favorites. Wallace Henry Hartley’s body was recovered ten days after the sinking of the R.M.S. Titanic by the CS Mackay-Bennett, a cable repair ship owned by the Commercial Cable Company, registered in London. The prized violin his fiancé had given him was protectively encased in his leather satchel and strapped to his chest. In 2013, his violin was sold at a private auction to an unknown private European collector for $1.7 million. On 15 April 2016, The Duttons and Branson Titanic Museum Attraction collaborated in commemorating the bitter-sweet story of the dedication, love, and courage of the Titanic’s bandmaster, Wallace Henry Hartley. The Duttons were privileged to perform “Nearer, My God, to Thee” in the exhibit room of the museum where Hartley’s magnificent violin display is being showcased in commemoration of the sinking of the R.M.S. Titanic on 15 April 1912. The Duttons are an extremely talented family from Branson, Missouri who are now international touring and recording artists. They are members of The Church of Jesus Christ of Latter-day Saints. They specialize in performing bluegrass to classical music but also doing everything in between. Their show features a variety of instruments including violin, guitar, bass, viola, banjo, mandolin, keyboard, harmonica, and drums, among others. They show their faith through their love and focus on family, and are an example to all who experience their performances whether in person or online.